In nineteen seventy four, my wife Maggan and I moved from San Francisco to the Sierra Mountains. We wanted to be remote and the property we bought, between Clipper Mills and Strawberry Valley, accomplished that. This is Maiducountry, forty-niner country, then big time logging and now extremely important water reservoir country, with an annual rainfall of eighty inches, more or less. We had very little down payment and I am still amazed that we could buy anything at all. Nevertheless, we found fifteen acres with an unfinished house. There was no running water or electricity but was heavily wooded with an ever- flowing brook. We brought our dear two week old Cassandra conceived nine months before back in our Victorian flat. It was the beginning of March and there was a foot of snow on the ground when we arrived, but a month or so before. I sold our vintage Lincoln town car and bought an old jeep that could scramble around in that snow all right, though since then, forty years ago, I have been detained in the snow many times. Soon the sun was hot; the sky was blue and the ground so red. Though I was brought up in the country, this place was an extreme shock. Maggan, a Swedish nick name for Margareta, my wife, is very durable and was no doubt so busy with our first baby and no modern amenities, she seldom complained. Within a couple of weeks of the first warm weather, Maggan was sitting on our front wood plank steps, our baby at her breast when I came bounding out the kitchen door and leaped to the ground. For some reason I turned and looked back and could hardly believe there was a rattle snake coiled up maybe two feet from her ankles. I did kill that snake but when I was done, I had to catch my breath. Since that time I have killed more and relocated some. I despise killing and always suffer from it, but at least for me that’s part of living at a place like this. After a while I was able to bring water up from our brook, fed by many springs, such a beautiful place. I put up a thousand gallon water tower which we used for a long time. We established a vegetable garden fulfilling our dreams of back to nature that we talked about on our big bed back in the city. It was so hard getting used to this life style that in the beginning we actually went food shopping all the way back in downtown San Francisco, about four hours away. There we were, stained with red dirt doing our food shopping back in our old neighborhood as if we still lived just a few blocks away. Little by little I adjusted some, but for more than twenty years I had the most vivid dreams of our perfect Victorian flat on Larch Street. Around nineteen seventy five, I was able to convince some people that I was a worthy sculptor. It helped to show them a couple of marble sculptures that I had made in my San Francisco studio,” Conception”, and “Embrace”. These sponsors funded the materials for my new studio, though I built it myself. In those days I was dedicated to marble sculpture. Back in the city when I wanted marble I went to a monument dealer, so I did the same thing here. I called Noel Moments in Oroville and spoke to Mr. Noel himself, a self-proclaimed old Okie. He was a rough old guy who said that he might have a piece about three hundred pounds or so but he wanted to meet me first. I was so excited I left right away. When I arrived he was kind of cool and I worried he had changed his mind. He was a big man and told me to sit down as he sprawled out in a worn swivel chair behind his desk, looking at me all the time. He asked if I drank tequila and I said sure, he raised his eyebrows, pulled out a bottle and poured us a couple of glasses. He watched me drink it down with no expression, got himself to his feet and ushered me into the next room where he had a magnificent old marble monument, in the form of a scroll, sitting on the floor. He helped me load it and eventually, through him and his son-in-law Ralph, I received many more pieces. When I got it into my studio I read the inscription Veer McDonald who died at sixteen. That thought haunted me and I began to think of her and why she died so young. Then the stone, because it was an unrolling scroll began to look like a wave, so I wondered if Veer may have drowned and decided to would make a wave in her memory. I did make a wave in her memory but not from that stone. Now that I had a studio again, I picked up for the moment where I had left off back in the City. I created a birth by an amorphous, humanesque being with her consort, in space. My plan was to make that birth in marble, so I bought a one ton block for the purpose but have not yet done so, however I did cast a much loved bronze version (to be seen in generation one). At this time I was preoccupied with family creation, in every respect. Fourteen months after Cassandra, Freja joined us, and then in three more years Ingmar was born. We were all very happy. I remember one Christmas Eve at about that time. There was about four feet of snow on the ground and I had skied out to a little store in Strawberry Valley. It was dark when I returned, our little house was deeply tucked in a hollow of snow, lights from our kerosene lamps glowed yellow through the windows, I heard laughter from within and the sky was a winter night’s spectacle, studded with sparkling stars. I was deeply moved and knew this was a moment to remember. There was so much we had to learn in order to live here. Our house requires about seven cords of fire wood over seven months. I had no idea of how to fall trees, cut them into small sections, split them up, load them in a pickup, let alone maneuver in the woods with a four wheel drive on hillsides, and clearing a jungle of brush, to make this all happen. I had especially one teacher though, Ray and the extremely macho men in the area more or less my age, mostly loggers and a few other variations of ourselves as role models. All the time Maggan was cooking on our bright red wood cook stove, making everything from scratch like soy milk and tofu, taking care of three children and growing and preserving a good bit of our own food. Soon everyone will be able to appreciate her talent at Maggansway.com. Between many other demanding homestead responsibilities I would work in my studio. During this early period, from about seventy eight to the turn of the century, I finished approximately eighteen marble sculptures as well as other sculptures in wax, terracotta and eventually small bronzes, to be seen in generation one and two, mostly distinguishable by the passage of time though there are conceptual changes as well. During my San Francisco sculpture period, a little more than two years, I made three marble sculptures:“Seed”, “Embrace” and “Conception”. Around nineteen seventy, Maggan and I were walking in a San Francisco redevelopment area and she picked up a small fragment of fine Italian carving marble, no doubt a corner of a marble step, from a demolished Victorian building. This was a pivotal moment for me since I was disillusioned with the past couple of years of film making. I finished HomeMovie in nineteen seventy, my little short dramatic production (to be seen under video in this site), and felt fortunate to have scored with this little flick. I felt this marble fragment was my salvation and I could hardly wait to make something from it. I sent for my sculpture tools back at my parents’ house in Indiana though I had only barely worked stone in the past. There was a small storage room at street level, our flat was on the second floor, I cleared it out, made a wood stand and furiously went after that little piece of marble, until I broke it. That was an overwhelming disaster but since it was an abstract concept it could afford this unintentional adjustment. The reconfiguration of this concept looked like a seed though that is not at all what its meaning was to me but that’s surely what it turned out to be. Maggan who came from an intense fine art family, her father and brothers, all professional artists, said that it was good. I guess that’s all it took having made a lot of sculptures since then. Now all I could think of was my next sculpture and where to get another piece of marble. The obvious place was a monument dealer. A generous Italian man noticed my excitement and just gave me a piece that I made into embrace,(seen in generation one). So the next piece I had to buy and made “Conception”. I built an enclosed open air studio on the roof of our flat. I met a lot of new people up there and since the buildings around me were taller, the neighbors watched with entertainment and curiosity. I made “ Conception” only and then it was time to go to the mountains. Long before we got electricity, we got a telephone. One fine day I got a phone call from a man, who would make a big difference in our lives, my cousin the great restaurateur Philip Romano. Philip had become an art collector and heard that I was a sculptor; soon he and his wife were our guests. I showed him a number of finished marble pieces and that evening after supper I showed him a small wax study ,”Twirling Feminine Form” he picked it up, twirled it in his fingers and asked if I would make that for him. I was just as happy as I could be of course. He wondered if making it in black marble would be possible. I didn’t want to but was afraid to say, so I said that black marble smells foul when it’s, carved, which it does. He smiled and turned to his wife and said: “hey Libby, Philip doesn’t want to use black marble because it stinks” and we all laughed. The truth was at the time I was obsessed with white marble, a vestige of Neo Classic in the abstract mode maybe. As time went on Phil, as he is called commissioned all together three large sculptures and has several small pieces of my work, as well. Phil has been a long time painter and in the last decade, or so, has come on to the scene with large, bold, colorful and flawless contemporary paintings. It wasn’t just the great importance of his patronage but the kindness hospitality and his many variations on generosity. Neighbors are not close around here, winters are intense with deep snow and for the early years, no snow plowing. That meant no matter how deep the snow became, I was still determined to get in and out. After a while the children were in school, the bus stop was out on the main road and that was especially challenging. I can hardly imagine it now, different pick up times, dark mornings, deep snow, it is all a jumble to recall, probably like battle with no violence, just struggle. I do have a sense of triumph though, however nowadays the road is plowed. I had been showing in the Accurate Art gallery in Sacramento and doing pretty good. Berry Gromala, the owner, bought the” Embrace”. Then through the gallery, a marble commission called “Collision”, a mad embrace. A very passionate lover of art, Cynthia Mac Clay, bought “Conception” and soon after she sent me a powerful, recorded, spiritually inspired description of the perfect male and female relationship called “Twin flame” and asked me to interpret this poetry in marble. I could hardly think of a better idea and soon made a maquette in wax; she approved it and I decided to make it in bronze. Ultimately I went on to make it in marble, as well. About that time I bought an old car from a used car lot and made payments right there. I showed up to make my payment one day and the owner said that I should make it to Dan, the new owner. Dan looked like a biker and had an unusual brand of respectfulness about him. He acted like we had already met and asked if I would make him a stone wall. I told him I was out of that business and had gone full time sculptor. Standing about one foot away he said “all right I want you to make me a sculpture”. He said he had a plaster cowboy holding a Winchester and a saddleback at his place and wanted me to follow him there to make a deal. I think blown away would explain my reaction. I said sure, I always say that. I went out to our car loaded with my family, I told Maggan, who said “this is ridiculous, let’s go shopping since that’s what we came down here for”. I said ”no I think he’s serious.” Suddenly there he was, pulled out in front of us, in some exotic car, motioning us to follow. Shortly we were up in the foothills at his gate. We circled around a hill to a pretty nice house on top. There were ostriches roaming around, one actually nipped Maggan, Dan apologized and we went in. The place was well decorated Western style and his better half, a thin blondish, hazy eyed lady, greeted us and all the gals sat down in the living room, while the guys went off to Dan’s den on the second floor. There were lots of guns of all kinds and just as conspicuous was his floor safe, open and stuffed. He laughed and handed my son a stack of paper money to hold then he reached in a sack and gave us all and an ounce of silver, we still have them. Dan said that he could not find the cowboy and I said that’s OK I know what one looks like. This was to be a bronze about three feet. I said that I would make a small wax sketch for his approval, he asked how much I said five thousand and he peeled off twenty five hundred as a down, from the stack. I needed a male model and my way is to make figures naked then cloth them. I didn’t want to bring in a male model because for one thing he would have to be perfect. I realized the most perfect naked examples I had were superb pictures of Michelangelo’s David. I think I spent about a week copying Mikes David but when it came time to give this cowboy a face I just couldn’t do Dave, so I flipped through the book and found a wonderful picture of Michelangelo’s Brutus which fits quite nicely on David body. Check out generation two, to see how I did. Well, one evening I had fallen asleep in front of the TV and Maggan shook me urgently, “wake up, wake up” and there they were stuffing my man Dan into a police car .The biggest meth bust in Oroville, Ca history. Dan went to prison for ten years and then he went back again for another long stretch. Well that was the end of the project but the maquette does have a lot of popularity and can be seen on generation two. About stone work, please see some of my work under Field stone in this site. Shortly after we moved here, my in- laws visited from Sweden .Not far from here Olle, my father-in-law, noticed exceptional natural building stones along the highway, and when he saw no enclosure around part of our house he called it a wolf barn and told me to go back and start bringing a lot of those stones home for an enclosure that he would build. Well, I never really stopped. Gathering field stone (flag stone) and building with them, mostly on our own property, has become a lifelong preoccupation. I love them, they are the stuff of culture, and it’s partly what makes the old country so beautiful and why we like to visit those places. I have always had some sculpture project I was passionate about. Though for a year and a half I made about a dozen or more professional natural field stone projects. Professional stone masonry just did not work for me. Fine art simply has a greater vocabulary if one is inclined to speak that language. The greatest priority I had for more than two decades, most of the time I have been writing about here, was being the best father I could be. Then after a time it seemed would never end, our first daughter left home for college, then the next, then our son left on his eighteenth birthday, that was a sunny day and when he pulled out of our drive I felt like I had been shot with a gun. The dream had ended, the nest seemed empty, I had no Idea I would feel that way. I really did not get over this for a long time, but I finally did. I realized that I had to fill that unexpected void and really what that meant was more time for sculpture. Fortunately I had a commission that demanded my attention, the marble version of “Twin Flame” and so it turned out that the bronze version was more successful than the marble rendition, though Maggan does not necessarily agree, please give me your opinion. I often feel like the keeper of the canyon. Our property is on a hill top, a little road passes through here down a steep canyon road to Lost Creek Lake, less than a mile away. In the winter, or really any time of year, if anyone is having a problem, generally stuck, this is the place they come to for help. I always help, and at times it has been an extraordinary challenge but fun. One late winter afternoon there was that familiar hello greeting called from beyond our stone wall. I opened the door to a well-dressed handsome man, with an unusual big grin. He said that he and some friends were stuck in a snow drift down towards the lake and that they had spent the night in their car. It sounded to me like they must have had a rough night, but there he was smiling like everything was even better than great. Most people are making excuses for themselves about now but this guy seemed happy about it. We started down towards the lake and all the way he walked with a swagger and bounce in his step and I must say I thought he was rather annoying for getting himself and his friends into this situation and acting like it was all a joke. We got to his tiny new four by four Kia. As soon as we arrived, out stepped a dignified old man, then a large woman, then a fully grown golden retriever. All night long in that tiny car, including Mr. happy go lucky and nobody was stressed or seemed uncomfortable. They were quite stuck and my little snow cat wasn’t running. The best solution, I thought, was to drag them out with a log skidder, that’s what they use to plow snow with around here on back woods trails. I walked back home and called someone I thought could help, Dave said he would and by the way would I be interested in making a centerpiece sculpture for the developing Marysville War Memorial. This sounded like my big chance to make a public monument since I had never made one; it seemed potentially the most exciting proposition of my career. Then I heard a lot of noise from out at the road, tires howling in the snow, a racing engine and people shouting. I excused myself to Dave and said I would call him right back. I was absolutely amazed to see that Kia out in front of my house when I was sure it would take heavy equipment to do anything. Think what you like I don’t blame you, they just weren’t that stuck, but they were. Now they had gone off the road in front of my house and were stuck again. All I could think about was that phone call and getting rid of these people. I could easily pull them out this time with my Scout. There he was out in the disaster zone, seemingly undisturbed with that smile and now he was laughing. He came up to my window and said thanks and I said sure. I think I began to admire him about now and asked his name, he answered Gabriel, then I remembered that phone call and I just said good luck. Soon I met with Dan Logue now state legislator and then aspiring supervisor and chairman for the Marysville War Memorable and his committee. Never before, or since, have I worked for a better man than Dan. He cut a straight trail through every obstacle and we built two world class war memorials in a short time, Yuba City being the other one. Then right away Dan recommended me for another commission “The Pomo Indian Family” in Lakeport, Ca. Before I was finished with “The Pomo Indian Family” I received an invitation to compete in Sacramento for two separate commissions. I won one quickly, my ”Folsom Bound” for the City Of Folsom, CA historic light rail station, and the second where I was an alternate for the Warren E Thornton Juvenile Center in Mather, CA. I met the winner and she said that she was going to Italy and I joked and said that maybe she would fall in love there and not come back, she smiled, well she did. There was a lot of confusion, I don’t think Sacramento wanted me to have two commissions at the same time so they ran another competition for the job but this time I won, straight up. This was my largest budget and I spent most of it on the job which is what I am inclined to do, six life size figures and two half size and more. During this time I also made a twelve foot modern concept for Philip Romano. Since I made Folsom Bound for the city of Folsom I was invited to compete for their New War Memorial and I was awarded that commission along with a landscape architect for the ground work. 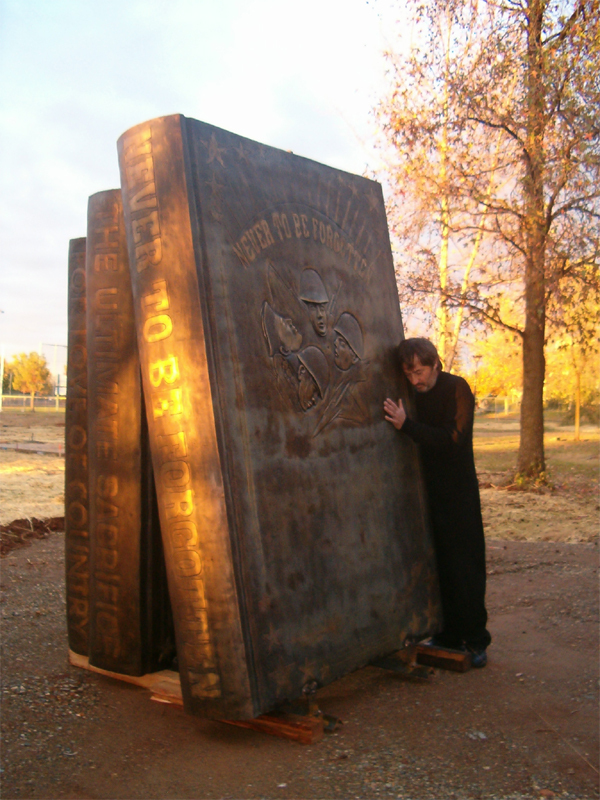 Here are the largest bronze cast books in the world along with many figurative and stone components both inside and out, see generation three. During this time I also made “Irene”, a little fountain girl, commissioned by Ray Fowler in memory of his wife Irene, after they fell in love with another lovely fountain girl in front of an emergency room they visited. “Irene” is in front of the Fowler home, see generation three. The City of Citrus Heights, CA invited me to compete for a sculpture competition. I designed “Celebrate Citrus Heights” after being inspired by the civic atmosphere at that time and after about a year I was awarded the commission. They also asked me to produce the competition maquette in bronze, about fourteen inches, which I am very proud of. While I was waiting for the Citrus Heights award, the City of Sparks Nevada saw the eagle that I had done for Folsom and asked me to make such an eagle for them. They were nearly completing their fabulous out door sport center Golden Eagle Park. They wanted an eagle in the center of their round-about near the entrance of their park. The Sparks Golden eagle is touching down on a nine foot Sierra White granite obelisk. The wings are uplifted and larger than the Folsom eagle, the tail and feathering were redesigned but the same mix of mostly bird, part fighter jet remain, seen in generation three. All of these projects in a little less than a decade. I may have been the busiest sculptor in the world, certainly one of them. It is not that I was without work before Gabriel but it has been breath taking after him. Someday I will tell you the rest of the story, and now there is the present and the future.